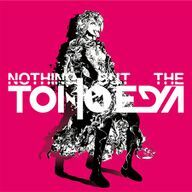 Nothing but the TOHO EDM is a doujin album by IOSYS released on 2014-03-30 (Touhou Meikasai 8). It features vocal and instrumental arrangements of themes from Embodiment of Scarlet Devil, Perfect Cherry Blossom, Imperishable Night, Mountain of Faith, Subterranean Animism and Undefined Fantastic Object. Half of the songs on the album are parodies of mainstream EDM songs, and the other half are remixes of old IOSYS songs. The album title and artwork are parodies of the album Nothing but the Beat by David Guetta. Track 1 is a parody of Turn Me On by David Guetta and Nicki Minaj. Track 2 is a parody of Booyah by Showtek, We Are Loud!, and Sonny Wilson. Track 3 is a parody of Clarity by Zedd and Foxes. Track 4 is a parody of Bonfire by Knife Party. Track 5 is a parody of Toulouse by Nicky Romero. Track 6 is a parody of Take Over Control by Afrojack and Eva Simons. Track 7 is a parody of Atmosphere by Kaskade. This page was last edited on 9 July 2017, at 15:11.